We used to live in a “wired” world before and now we are moving towards a “wireless” world. The internet has changed our world like none has ever dreamed some 15 years ago. We live in a “highly connected” world now, that you can control your home in Washington DC sitting in Miami beach! The first internet connected wireless thermostat was Nest smart thermostat – which was released in 2011. Later Ecobee and Honeywell came up with WiFi thermostat models in market. In this guide, we review wireless thermostats or WiFi enabled thermostats which could be controlled over internet using mobile apps. Why Go for a WiFi Thermostat? #Control from anywhere – A WiFi thermostat can be controlled through internet from anywhere in the world. Set/change temperature, turn ON/OFF, set new program/schedule – you can do it all while you’re away. #Accurate Weather Prediction – They fetch local weather conditions from internet and sets program/gives alerts. #Everything on Mobile Apps – Get temperature/humidity levels, energy usage reports, alert messages all on your mobile app. Wireless/WiFi enabled models are available for all the different types of thermostats – be it for a furnace thermostat or a heat pump thermostat or a boiler thermostat or even the electricity powered line voltage or baseboard heater thermostat has WiFi enabled variants available. Let’s see the best wireless/wifi thermostat models in each category! Let’s begin with smart thermostats – which are self learning and programs itself automatically. Smart thermostats are the innovative & high end thermostat models available in market today. All smart thermostat models have wireless feature and they can be controlled via your home WiFi. We’ve shortlisted 3 best WiFi smart thermostat models for you to choose from. Ecobee is a new generation home automation company (just like Nest), and they have two flasgship smart thermostat models – Ecobee 4 and Ecobee 3 Lite. Out of these 2 best selling models, Ecobee 4 is the full featured version with complete features of a smart thermostat. Ecobee 3 Lite is a budget model (priced affordably) and is basically a trimmed down version of Ecobee 4. We’ve reviewed both thermostats detailed in our article – Ecobee Smart Thermostat Review. Ecobee 4 and Ecobee 3 Lite – both models are wireless and home WiFi compatible. You can connect them to your home WiFi network and control them using the Ecobee mobile app. Ecobee4 is a wireless room sensor thermostat, as it comes with an extra room sensor (which is interfaced wireless to thermostat). A quick review of important technical specs about wireless/internet connectivity of Ecobee 4 and Ecobee 3 lite is furnished below. If you’ve Ecobee WiFi thermostat in mind, you’d get detailed tech spec from our review of Ecobee thermostats. Nest is the pioneer in smart thermostat models and they have Nest 3rd Gen (the full featured model) and Nest E (the budget friendly model). Nest & Ecobee are equally competent thermostat models, and you can choose any one after reading through individual reviews. We’ve covered Nest 3rd Gen and Nest E in detail – where we cover full features of both Nest thermostat models, compatibility and comparison between Nest E and Nest 3rd Gen. Both Nest models – Nest E and Nest 3rd Gen are wireless/WiFi smart thermostats. Unlike Ecobee4, the full featured Nest 3rd Gen doesn’t come with a wireless room sensor. However, you can purchase additional wireless room sensors from Nest and interface it with your thermostat. You can read such technical details by following our individual reviews of Nest and Ecobee. A quick nutshell of important tech specs regarding WiFi and wireless connectivity of Nest E and Nest 3rd Gen is furnished below. If you’re seriously considering Nest wifi thermostats, we encourage you to go through our detailed review of Nest thermostats. Sensi ST75 is an affordable smart thermostat with all essential features except “self learning” or the auto programming feature. We’ve covered review of Sensi ST75 in detail – where you can find full details about its features, HVAC compatibility and much more. Sensi ST75 is a WiFi thermostat which houses all the necessary and essential features of a modern day thermostat but it lacks the supreme “self learning” of smart thermostats. We’ve put together a table showing all the important tech spec regarding wireless/internet connectivity of sensi ST75. If you’ve Sensi ST75 in mind, we recommend you read our full review of Emerson Sensi ST75 and make your mind. Smart thermostats makes our life so easier with its high end features & functions, but they are high priced. If you don’t have the budget for a smart wireless thermostat, choose an affordable wireless/WiFi digital programmable thermostat. These are basically the popular 7 Day or 5 Day programmable digital thermostats equipped with wireless and WiFi capability. You can control these thermostats via internet using your mobile phones (using the apps installed) – like you can turn ON/OFF, change temperature settings, change program schedule etc. We’ve shortlisted 3 best wireless/WiFi enabled digital programmable thermostats for you ti choose from. Read through our list and see the highlights of each model. Honeywell is still a leader in thermostat market (they enjoyed unchallenged position until the arrival of Nest and Ecobee), though they are only 3rd or 4th in smart thermostat rankings (Honeywell has a smart thermostat model named Lyric – which is not very popular compared to Nest and Ecobee). RTH9585WF – is a WiFi 7 Day programmable thermostat from Honeywell with color touch screen display and Alexa enabled voice control. RTH6580WF is an economical, budget friendly wireless programmable thermostat from Honeywell. This is one of the best selling and popular thermostat models out there with almost all essential features. The key features include Alexa enabled voice control, 7 Day programmable, 4 programming modes, and can be interfaced with smart hubs like Apple Homekit, Google Assistant and Samsung SmartThings. Line voltage thermostats are used for heating/cooling systems running on line voltage (120 or 240 volts). An example would be baseboard heaters – where direct electricity is converted to heat energy. Only about 10% of homes in America uses line voltage based systems. A majority (that is about 90%) of homes uses low voltage systems like a central furnace or a boiler or heat pump based systems. The key info here is that a line voltage heating/cooling system requires a thermostat that runs on line voltage. You can not use a low voltage thermostat (like Nest or Ecobee or Sensi) with a line voltage heating system. You may read our complete guide on Line Voltage Thermostats to see different wireless/WiFi high voltage thermostat models. Heat pumps are common in most of the homes in USA. Some of the homes use heat pumps with auxiliary/emergency heating. If you’ve a heat pump with aux/emergency heating, make sure the thermostat you choose supports the same (be informed some thermostat models doesn’t support auxiliary heating). As we’ve written before, 90% of Americas runs on central furnace or boiler based systems or heat pump based HVAC systems. All these 3 systems are low voltage HVAC systems. We’ve reviewed right thermostat models for each of these systems individually in our guides – say Guide to Choose Furnace Thermostat or our Guide to Choose Boiler Thermostat. We’re listing handpicked wireless thermostat models for furnace & boiler based systems here. #1 Ecobee 4 & Ecobee 3 Lite – are excellent choice as WiFi thermostat for central furnace based or boiler based systems. They are compatible upto 2 stages of heating. #2 Nest 3rd Gen & Nest E – are the next best (or as equally best as Ecobee models) choice as WiFi thermostat for furnace/boiler based systems. If you’re a little curious here, “underfloor heating” is used in homes to heat the floor surface. A heating system (either insulated electric wire based or hydronic/hot water based) is installed under the floor to heat the floors evenly during winter. Underfloor heating systems are common in homes located in places with extreme winter conditions. We’ve reviewed different models of underfloor heating thermostats – and we’ve covered some wireless underfloor heating thermostats as well. We’re listing one of the best wireless thermostat model for underfloor heating below. We believe, you’ve been benefited by reading through our wireless thermostat reviews. Choosing the right thermostat for your home requires intense research, like identifying your current HVAC system, your current wiring type, which type of new thermostat you need and so on. We crafted our website ThermostatGuide – as an authentic resource on thermostats helping people buy the right thermostat. We intend to help you choose the best wireless/WiFi thermostat with this article and we believed we’ve been of help for you in your research. Is my heating/cooling system (HVAC) compatible with WiFi thermostat? Compatibility of a thermostat varies with different models. Compatibility of Nest is not the same as that of Ecobee or Honeywell. You should read the compatibility specification of the wifi thermostat model you prefer. We’ve clearly written about compatibility in the individual review of each thermostat. Will my WiFi thermostat work without Internet or WiFi ? 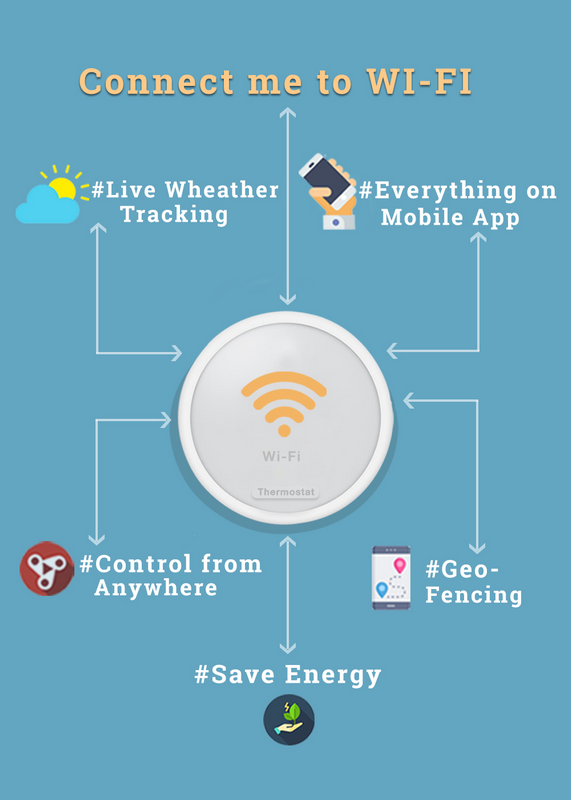 Any WiFi thermostat model will serve its core function – that is controlling your HVAC (heating/cooling) system and regulating temperature without any internet connectivity or an active WiFi connection. They use the already set schedule/program to maintain temperature. 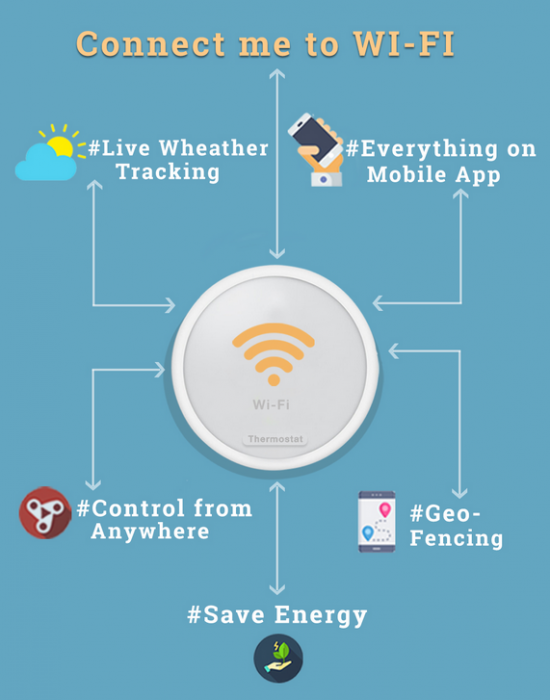 An active WiFi connection is only needed when you want to control the thermostat (say change temperature setting or schedule) from an away place over internet (using your mobile phone). Also some advanced features like live weather tracking and geo fencing would need an active WiFi/internet connectivity. Can I connect WiFi thermostat to Smart Hubs like Alexa, Homekit ? Most of the best wifi thermostat models like Ecobee4, Ecobee 3 Lite, Nest 3rd Gen, Nest E, Emerson Sensi ST75, Honeywell RTH9585 can be integrated with smart hubs like Amazon Alexa, Google Assistant, Apple Homekit, Amazon Echo etc. Some models are compatible with other smart hubs like Samsung SmartThings, Wink. Integrating with a smart hub enables you to control your thermostat using your voice.